Each club perfectly tuned for optimal lift, distance and control. • Authentic forged irons deliver uniform metal density for better feel and distance control. • Progressive V-FOIL weighting for up to 70% more directed mass behind the hitting area for more power and easy lift. • The 3 & 4 irons incorporate the same game-improvement technology found in our ultraforgiving, V-FOIL forged 1025C cavity backs. • The 5 & 6 irons are transitioning cavity backs, seamlessly blending toplines, offsets and lofts from cavity to muscle. • The 7-PW feature the same shot-shaping control as our ultraplayable, V-FOIL forged 1025M musclebacks. • Rifle Flighted shafts—higher launch in the long irons—a lower, more controlled and penetrating flight in the short irons. Available in 5.0 and 6.0 flexes. • Precision CNC-engraved, square cut scoring lines for consistent control. • 100% nickel chrome finish for durability and style. • Golf Pride Tour Velvet grips. I have played S-300 forever but now I am 56 years old. Came across a like brand new set of of these iron with Rifle 5.0 flights shafts. As most know, Rifle shafts are slightly stiffer than the competition. So the 5.0 are right between R and S flex. Perfect for me and the forged irons feel as good as my Mizuno GF-forged irons. I don't have any negatives. I just went back to an old set of Magregor V-foil irons in lieu of my new set of Titlest DCIs. They are the best irons I've ever played. The feel and feedback I get from a well struck shot is undeniable and the boring and penetrating ball flight is a joy to watch. I use to buy new equipment all the time, but have come to realize that other than some minor shaft, ball, and driver improvements there has not been any real improvement in iron technology. I have them in Rifle 6.0. Got the 3 and 4 iron switched to more flex. Besides that, sweet clubs. Gives great feedback on shots and impressive workability. Love the Macgregors. So sad a great club maker like this got reduced to what they are today. I guess bad management goes a long way in destroying even the best in a market. On the lighter side of things, when I hit those VIP's with a penetrating ball fight and precision and oh how softly they stop on the green, people do get curious and cant help taking a peek in my bag to be intrigued by those beautiful beautifully shaped weapons gleaming in the sun. I can go on and on but I guess you get the picture. Bought a used set for cheap on e-Bay. The previous owner owns a golf shop and reshafted his set with DG S-300, which increased the swingweight to D-4. I prefer a heavier swingweight for feel...it is easier for me to release. Basically, I "stole" the set. These are great irons. A good swing results in a perfect boring trajectory, and they are easy to hit high or low. Knock-down and punch shots travel low and true. You can work the ball with either the cavity backs or the blades, although it is obviously easier with the blades. They set up nicely, too. It will take a while to get the distances down with a new set, and I imagine one or two clubs will have to be adjusted for the loft. The PW is a little too strong (goes too far) for my liking, but that can be resolved by shortening the shaft (it was the only club that swingweighted too high, anyway). Negatives? These are not for people who can't get through the ball. although you can pick the ball clean and hit it high with little loss of distance. I am very pleased with this set, bought primarily because nobody else bid on them (got them cheap) and because they had the shaft I use. Titleist and component (assembled my own). Best clubs I have owned....I've always been a MacGregor fan so I was happy to see these clubs offered. Liked them so much I also bought a set of graphite shafted senior flex so I can use those in a few years. At this point this review will only serve those persons that will buy this set of irons in used condition, or those of you who are lucky enough to find a new set that may still out there. MacGregor discontinued these irons last year. It is a shame really, since these irons are not only excellent to play with, they are truly the best looking irons to come to the market in years. With a sleek look that is reminiscent of the classic irons of years gone by, these clubs have been described as more like jewelry than sports equipment. As you no doubt are aware, in golf the look of a club, if you like it, helps to impart confidence. In spite of the fact that the set is forged (a thing that scares many mid-handicap players away), the MacGregor 1025CM’s are incredibly playable. Because the pitching wedge through seven iron are muscle-back blades, they impart something almost lost in most golf irons these days, feedback. The feedback is not harsh, however, it is just enough to let you know a solid strike from one not so solid. I have found that even on those thinned shots where the feedback is evident, there is little, or no loss of distance and direction, just a lower trajectory. Solid shots are rewarded with no feeling at all, or what some have referred to as a”buttery” feeling. The six through three irons are cavity-backs, completing the mixed set. Again these cavity-backs have a luxurious look. The other day a golf partner picked up my six iron and commented, “These are nice!”. The cavity-backs are easy to hit. They fly long and straight with a high trajectory that helps stop longer shots, something that really helps control distances. My set originally came with rifle shafts, but I had them changed to DG S300's per launch monitor results. As with anything else in golf, these irons should be correctly fitted for your swing. I wish every set of golf irons would look and preform like these. Alas, even MacGregor has gone away from its classic look....again...opting for a larger blade with a satin finish as a replacement. Oh well, finally I can say something that has been a long time in coming. I see no reason to change my irons in the foreseeable future. Can't say enough for this set of Irons. Have bought and sold more sets than I can count. These are the best feeling, most forgiving, set of irons I've ever places in my hands. Even the blades are easy to hit. These are as close to perfect as a set of irons can get. Got them for $399 at Edwin Watts. Sent them to be bent 2degees upright and had them back in 5 days. You name it, I've played it. Nearly lost a wife while on this search. I bought these irons abouts 8 months ago and find that they are the best irons I have yet to play. I switched to these from the Cleveland TA1's. I think that the long irons in the MacGregors are very solid and accurate and with the 7-PW you can just attack every pin. I have went from a 8 down to a 3 handicap in 8 months and I plan on being scratch in just a few more. I have played the MP-32's and many other blade and cavity back irons and find these to be the best fit from tee to green. If you decide to get a set of these I must say that the shot dispersion with the Rifle shaft is alot tighter that the DG S300. The Rifle shaft from club to club seems to be alot more controllable than other shafts and the trajectory is very consistent as well. Haven't had to use them yet. Cleveland TA1,Mizuno MP-32,NIke Pro Combo,TaylorMade TP and mant others. 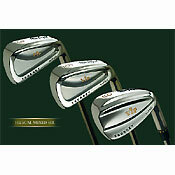 I was looking to replace my aged (and 7 iron-less) set of T-Zoid Comp EZ's. Bought a set of 1025CM's with 6.0 shafts on Ebay for $150 based on the reviews here. I felt like I had run into the limit of workability of the Zoids and blades seemed like the next step, however, the mixed set was a way to avoid the total commitment to playing blades, as I wasn't sure my game was up to it. It's been a few range sessions and two rounds now... and maaaaan! These clubs are incredible. The feedback is stellar. They are very easy to control, and work left and right. For any mid/high handicappers like me concerned about the "blades are for scratch golfers" thing, forget it. These are incredibly easy to hit and are still very forgiving. Mis-hits for me tend to fall 20yards or so short of the target but stay online pretty well. But hey... it's a MIS-HIT right!?!? And there's nothing like hitting the sweet spot on these babies. Excellent trajectory, lots more spin than my Zoids and sooooo workable. I only have two problems so far, which are probably not the fault of these clubs. First, distances. I figure it'll get better with time, but I'm getting a range of nearly 30 yards in distance with each iron. Second, the CB irons (3,4,5,6) have too much offset for me, and I would think for most people that don't slice. My regular set-up for 3 iron draw produces a nasty pull/hook. I have to "fade" it to hit it straight and damn near clice it to move it right. I'm probably going to end up buying a full muscleback set of these clubs, since the 7-W are soooooo easy to hit, and they have significantly less offset. Oh. And one last thing. Even used, these clubs are gorgeous. Two rounds and I've already gotten 3 or 4 compliments. I have been playing for about 10 years.In this time I have tried every club on the market.I just found them in the macgregor 1025CM.These are the easyiest forged irons to hit on the market.I have the rifle 5.0 shafts and the ball flight is perfect.This B.S. about being a low HCPER to hit blades is nonesense.I would say to all 20 HCP and below.BUY THESE CLUBS.They are the best looking Irons too.Soooo Soft at impact. Have tried them.But I have used Macgregor before and the service was impecable. Ping eye 2,Hogan apex,Callaway x14 pros,Clevland Ta 3,5s,4s.Ram fx.